The MPF 1P (MicroProfessor 1 Plus), is an improved version of the MPF 1. Like its brother, it is a learning tool for use in the teaching of microprocessor, microelectronics, and control technology. It has a better keyboard. Instead of the hexadecimal keyboard of the MPF 1, this one is a real "QWERTY" one, with CONTROL and SHIFT keys. There is even a RESET key at the top right (red key). The main board has also been redesigned and the RAM capacity is of 4k on the standard model. 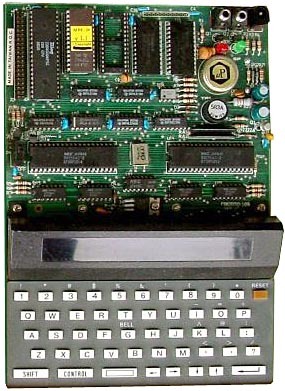 Despite its poor features, the MPF-1P had great expansion possibilities with an input/output control memory expansion (IOM-MPF-IP), an optional printer board (PRT-MPF-IP), an Eprom Burner board (EPB-MPF-IBP) and several applications delivered on ROMs. see more Multitech MPF-1 Plus Ebay auctions !